PMR prides itself in providing one of the finest facilities available. Our facilities, although beautiful, clean and organized, are designed with function in mind with the aim of keeping the horses, clients, and staff comfortable, happy and in optimal health. 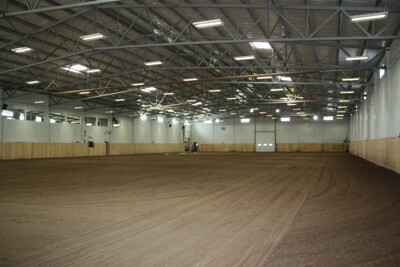 Our indoor arena has a 115 X 230 riding surface and every detail has been considered. Ample natural light coupled with state of the art lighting and radiant heat provide an always comfortable riding and viewing experience. The ground at PMR was supervised by none other than Bob Kiser himself and is watered and worked regularly by our Kiser Dragmaster. Bleacher seating in the arena offers a great spot for viewing and being a part of the activities going on in the arena. PMR has a full sound system that was professionally installed, with speakers located in the arena, upstairs viewing area and in the main barn aisleway. As a participant or a spectator you can be assured that you will not miss out on any of the action happening in the arena. Our boarding area includes 20 fabulous 12 x 12 stalls with rubber mats and automatic water, all in a bright, spacious and well-ventilated environment. In-floor heat in the aisle-way provides a safe walking surface for our equine friends and the comfort of their humans. To keep dust to a minimum, we have an industrial vacuum that is used daily to clean all the aisles in the barn. 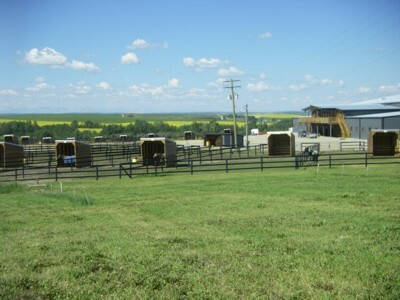 We offer daily turnout, weather permitting, into individual custom designed paddocks with shelters and heated automatic water. PMR offers the finest in hay and supplements and prides itself on quality care. We will feed any additional supplements supplied upon request. As another convenience PMR also offers an on site laundry service using our commercial grade heavy-duty washing machine. This machine is capable of handling most blankets, so there is no need to make a special trip to get your blankets washed somewhere else. 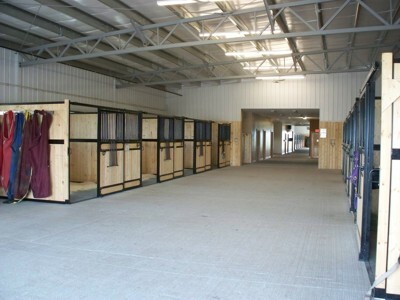 Boarders have full access to the washrack with both hot and cold water, tackrooms and grooming stalls. The comfortable lounge/kitchen area is a great place to hangout, have a coffee and some snacks and enjoy a visit with the other boarders or trainers. Other amenities include cowboys and cowgirls washrooms complete with showers. Our large upstairs viewing area is a great place for watching a clinic, holding a banquet or just relaxing and enjoying the atmosphere with friends. Washrooms and kitchen facilities are located up here so it makes it a great place for hosting most events. The balcony overlooks our 140’ X 240' outdoor arena and the turnout pens. 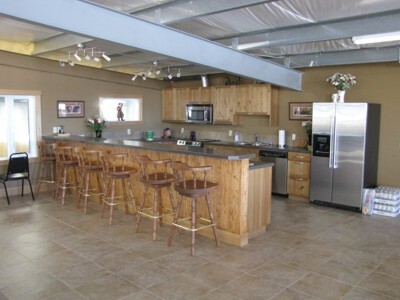 During the Summer months sit back and enjoy the sunshine and prairie and mountain views while watching the horses in their turnouts or checking out the action in the outdoor arena below. For those wishing to stable their horses overnight during clinics or events our auxiliary barn is now complete. 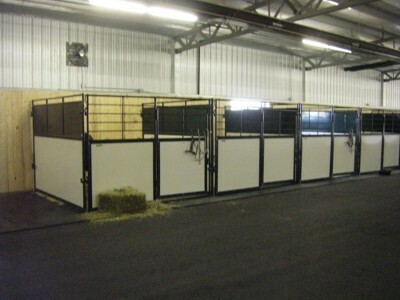 The barn offers 27 10' x 10' stalls complete with rubber mats. The barn is heated and well ventilated to ensure a healthy and comfortable environment for your horse. PMR has ample trailer and vehicle parking on a well-maintained gravel surface. We also have designated parking with plug-ins for living-quarters trailers, so no need to book a hotel, just plan on staying on site. Ride, relax and enjoy our facility!